The wild poppy has a delicate bowl or cup shaped flower. 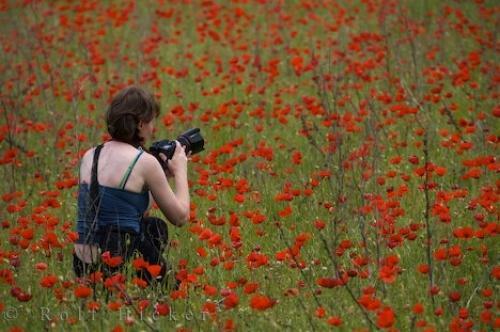 A woman photographing in a field of wild Poppies near Moustiers Ste Marie, Alpes de Haute, Provence, France, Europe. Model Released. Photo of a woman crouched in a field of wild poppies photographing near Moustiers Ste Marie, Provence, France.